Artists have used all sorts of odd media to create portraits, everything from guitar picks to dice to wooden eggs. Add to this list Brazilian type artist Álvaro Franca, who uses the typewriter. Instead of composing literary portraits of his heroes, Franca types out literal portraits. The principle of the pictures are the same grey-scale printing used in newspapers or, if you spent time in the computer lab in the 1990s, those dot matrix images that were such the rage among computer nerds. Using a computer, Franca breaks the image down into discrete pixels and adds one or more keystrokes to that pixel. 'I' and 'O' seem to work for lighter greys while visually dense letters like 'x'and “m” are used for the darker end of the spectrum. 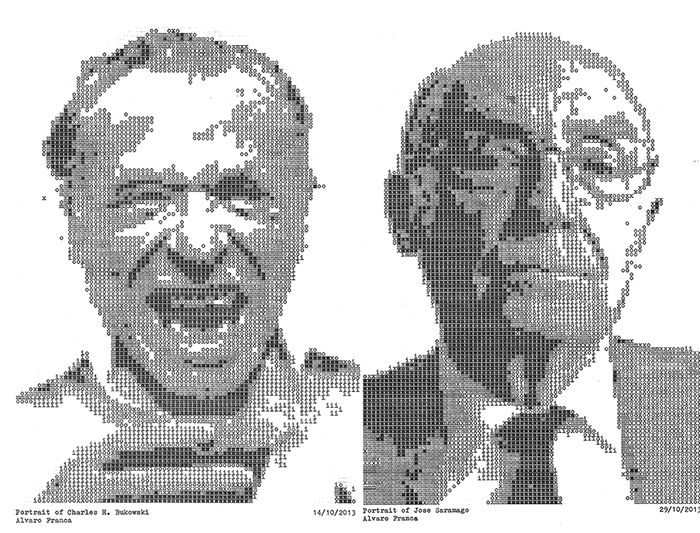 Typewritten Portraits is an experimental art project. During my exchange in the Cambridge School of Art, I developed a technique for imaging gray scale with the typewriter and, from there, I made portraits of five of my favorite authors in literature who worked on typewriters. The series is still ongoing and there are plans for five more pictures. You can see a time-lapse video of Franca creating a portrait of beat icon Jack Kerouac above. And below you can see a few more pictures including Charles Bukowski and Jose Saramago here.